In Loving Memory of John Cunningham Lilly, M.D. 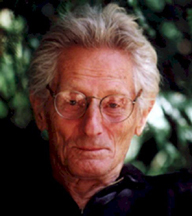 Dr. John C. Lilly died on September 30th, 2001, in Los Angeles, of heart failure. Dr. Lilly was best known for his work with dolphins and interspecies communication, his development of the isolation tank, and his research into altered states of consciousness. The main characters in two popular films, The Day of the Dolphin and Altered States, were based on Dr. Lilly. Born January 6, l915, in Saint Paul, Minnesota to Rachel and Richard Lilly, Lilly was educated at St. Paul Academy, California Institute of Technology, Dartmouth College Medical School, and the University of Pennsylvania Medical School. During WWII, he conducted high altitude research at the Johnson Foundation for Medical Physics. After the war, he trained as a psychoanalyst. While a Commander in the U.S. Public Health Service, Lilly worked at the National Institutes of Health, where he developed the isolation tank, which came to be known as the "Lilly tank". In l959, he established the Communication Research Institute in the U.S. Virgin Islands to study the vocalizations of Bottlenose dolphins. The work later continued in San Francisco under the aegis of the JANUS Project. He also established the Human Dolphin Foundation, and worked with Samadhi Tank company to help popularize the isolation tank experience. From the late sixties until he retired to Hawaii in l992, Dr. Lilly worked from his home lab in Malibu, California. He traveled extensively, teaching and lecturing at academic institutions, international conferences, and growth centers like Esalen, where he was a long-standing artist in residence. Dr. Lilly published over one hundred and twenty-five scientific papers, relating to his work in various fields, including Respiratory Physiology, Neurophysics, Neurophysiology, Psychiatry, interspecies communication, and the nature of consciousness and the self. He also published nineteen popular books, including the influential Man and Dolphin, 1961; The Dolphin in History (with Ashley Montagu), 1963; The Mind of the Dolphin, 1967; Programming and Metaprogramming in the Human Biocomputer: Theory and Experiments, 1972, 1987; The Center of the Cyclone, 1972, 1987; The Dyadic Cyclone (with Toni Lilly), 1976; Lilly on Dolphins, Humans of the Sea, 1975, a revised edition of two previously published books, Man and Dolphin, The Mind of the Dolphin, and The Dolphin in History, a lecture; Simulations of God: The Science of Belief, 1974; The Deep Selp: Isolation Tank Relaxation, 1976; The Scientist, a Novel Autobiography, 1978, 2nd. ed. 1988; Communication Between Man and Dolphin: The Possibilty of Talking with Other Species, 1978, 1988; In the Province of the Mind (with Francis Jeffrey); John Lilly So Far, by Francis Jeffrey (with John C. Lilly, M.D., Ph.D.) 1990; and Tanks for the Memories, Floatation Tank Talks, by Dr. John C. Lilly and E.J. Gold, 1995. An unparalleled scientific visionary and explorer, Dr. Lilly has made significant contributions to psychology, brain research, computer theory, medicine, ethics, and interspecies communication. His concepts, inventions, publications, and articulated explorations have dramatically enhanced the quality of contemporary global culture. His work with dolphins and whales created a global awareness that lead to the enactment of the Marine Mammal Protection Act in 1972. Today, Dr. Lilly is considered the father of dolphin researchers. In the 1940s, Dr. Lilly invented new types of capacitance manometers to aid in researches of human metabolism, and invented gas concentration and flow meters to study respiration, gas mixing, and pressure and altitude. In the '40s and '50s, Dr. Lilly was on the cutting edge of Neuroscience. He was the first to map the brain of chimpanzees, in the process inventing the "Lilly Wave": an electrical pulse that could be used to stimulate the chimp's brain without any damage. He also developed the twenty-five channel EEG moving relief maps of the electrical activity in the brain and dynamic iconic displays for researching pulse shapes and electrodes. His brain mapping with acoustic, motor, and travelling waves predated today's state of the art by fifty years. His research in electronic brain stimulation, dreams, schizophrenia, and the neurophysiology of motivation - involving the identification of punishment and reward systems -- were published in a number of psychiatric journals. In conducting his brain research, Dr. Lilly developed an interest in large brain systems. This led him to work with dolphin communication. In the process he invented various spectral analyzers and hydro-phones, and pioneered the use of minicomputers with real time programming and original software. While working at the National Institutes of Health on isolation, solitude and confinement, he invented the floatation tank, a tool to maximally isolate sensory stimulation to "better understand what the mind does without exterior influence. NASA and other important organization have used his research into sensory isolation. After ten years of tank research, and while still in the employ of NIMH, he was given the responsibility to experiment with LSD in the tank. The results of that study were reported and published by that institute in his classic treatise, Programming and Metaprogramming in the Human Biocomputer. Like all his research, this was eventually made available to the public. Dr. Lilly considered this documentation his most original work. This is where he first published his famous statement, "In the province of the mind, what one believes to be true is true or becomes true, within certain limits to be found experientially and experimentally. These limits are further beliefs to be transcended. In the mind, there are no limits"
Dr. Lilly's last physician remarked with awe that John Lilly is the only person he knows of whose least accomplishment was becoming a Medical Doctor. He has sown the seeds of several future scientific revolutions. Dr. Lilly leaves us with the possibility of a theory of internal realities. He developed the hardware/software model of the human brain/mind decades before the computer became a popular metaphor for the human brain. He worked towards a recognition of possibilities for solid state intelligence and planetary consciousness. He explored and theorized about the potential importance of Einstein, Podalski, Rosen, (PDR) and Bell's Theorem in quantum computers and teleportation. He initiated worldwide efforts at interspecies communications with large-brained dolphins, advocating United Nations protection and representation for the "Cetacean Nation." Devoted to a philosophical quest for the nature of reality and mind, Dr. Lilly pursued a brilliant academic career among the scientific leaders of the day. He has lived in the company of associates and intimates including Nobel physicists Richard Feynman and Robert Milliken, philosophers Buckminster Fuller, Aldous Huxley, and Alan Watts, psychotherapy pioneers R.D. Laing, Fritz Perls, and Oscar Janiger, eclectic spiritual and psychological interpreters Oscar Ichazo, Baba Ram Dass, Timothy Leary, Robert Anton Wilson, and a host of luminaries, inventors, political figures, writers, and Hollywood celebrities. One of the twentieth century's foremost scientific pioneers John Lilly has been a relentless adventurer whose persona as "student of the unexpected" has resulted in astonishing insights into what it means to be a human being in an ever more mysterious universe. He is survived by his first wife, Mary Lilly; brother David Lilly; son John Jr.; daughter Cynthia Cantwell; and adopted children, Pamela Christine; Nina Carnesi; Lisa Lyon Lilly; Barbara Clarke-Lilly; and Philip H. Bailey. John C. Lilly Memorial Celebration took place Friday, October 5, at Will Geer's Theatricum Botanicum, 1419 North Topanga Canyon Blvd., Topanga, CA 90290 2:30pm - 6pm. Memorial in Amphitheater by reception followed in the surrounding garden. In lieu of flowers please make your tax-deductible donation to the Association for Cultural Evolution, POB 2382, Mill Valley, CA 94942. This organization was established in 1990 as a not-for-profit Educational 501 c3 - for the purpose of archiving, preserving and making available primary source material of timeless cultural importance by Founding member of the Board of Directors, John C. Lilly, M.D, along with four other notable directors. Scientific Briefs of Dr. John C. Lilly, M.D. 3. Lilly, John C., and Thomas F. Anderson. 1943. "A Nitrogen Meter for Measuring the Nitrogen Fraction in Respiratory Cases." Nat'l. Research Council, CMR-CAM Report #299 PB 95882 Library of Congress. Photoduplication Service, Publication Board Project, Washington 25, DC. 4. Lilly, John C. 1944. "Peak Inspiratory Velocities During Evercise at Sea Level" in Handbook of Respiratory Data in Aviation. Nat'l. Research Council, Wash., DC. 63. Lilly, John C. 1960. "Large Brains and Communication." Paper Presented to the Philadelphia Assoc. for Psychoanalysis. 104. Lilly, John C. 1967. "Intracephalic Sound Production in Tursiops truncatus: Bilateral Sources" (Abstract). Fed. Proc. 25, no. 2.